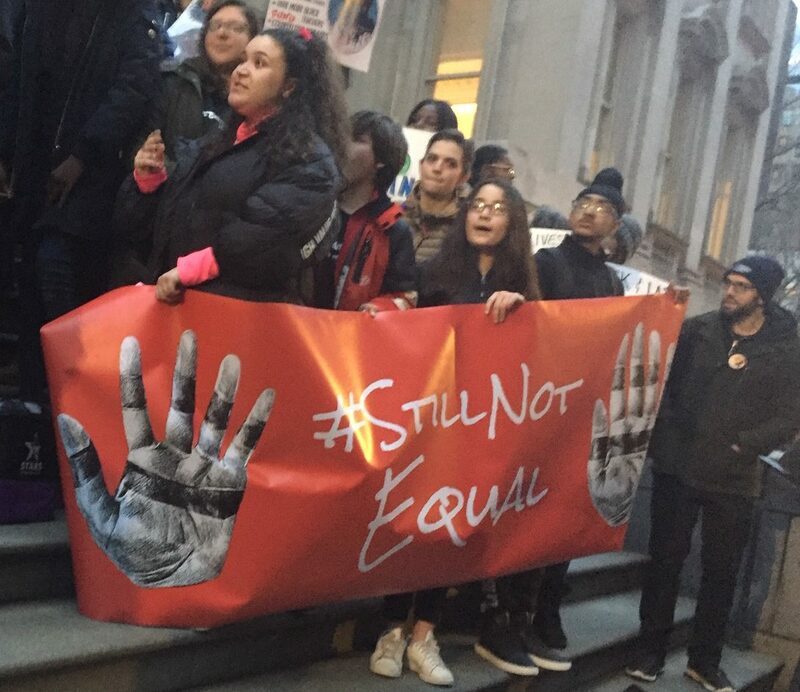 On Thursday evening, on the steps of the Department of Education’s location at 52 Chambers Street near City Hall, stood dozens of students, teachers, and activists from all over the city for the Black Lives Matter at Schools Rally. It was part of a nationwide movement to demand changes to how students of color are treated, mentored and taught about their history all over the country. During the 90-minute rally, some drivers who drove by the rally beeped their horns, and even gave the peace sign, to show their solidarity. 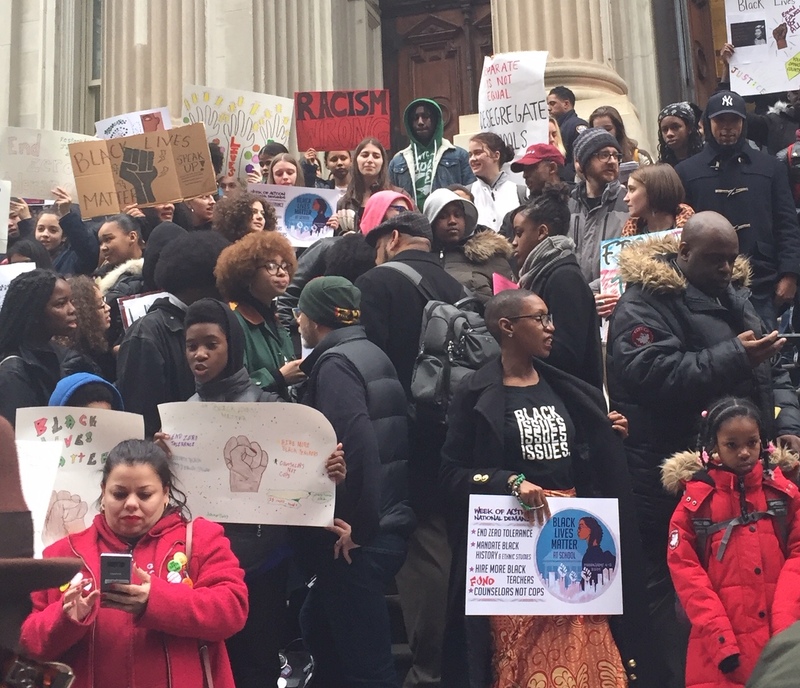 There were many passionate speeches and cheers, all declaring the need to change the curricula while talking about their experiences at New York City schools where 68% of students are either Black or Latinx, but teachers of color are hardly seen. Among their demands were including mandatory Black history and ethnic studies for all grades, hiring more Black teachers, ending “zero tolerance” discipline and having more counselors than cops in schools. Beckford was one of the early speakers. When he took the megaphone, the crowd cheered loudly for him. With his 7-year-old daughter by his side, Beckford spoke about the effects of the current lessons on Black history on Black students. Later, a student activist from Careers in Sports High School in The Bronx, Angel Perez told the crowd there were some aspects of Black history that are not taught in schools. Matthew Beeston, a youth leader from Urban Youth Collaborative, spoke out against how Black students are often treated as criminals in their schools, with higher suspension rates and even arrests, compared to their white counterparts. Leanne Nunes, one of the directors of Integrate NYC, wept with pride as she spoke to the crowd. Another student, who said she attends a predominately white school, said in the three years she had been there, she never had a Black teacher. It’s been a negative experience for her. Throughout the rally, there were various cheers, such as “Black Minds Matter”; “Futures Matter”; “We Matter”. 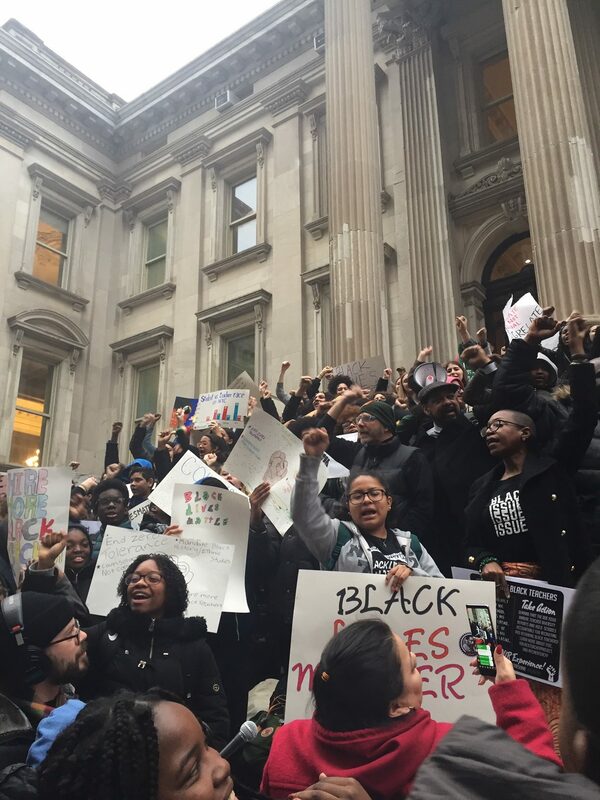 At the end of the speeches, while chanting “Black Lives Matter”, the crowd turned around and began to ascend the stairs that led inside 52 Chambers Street. They intended to deliver a list of their demands directly to Chancellor Richard Carranza. They were blocked by security guards. But no one was deterred. The crowd remained optimistic and was full of spirit, as speakers reiterated that they would not stop until all demands were met. 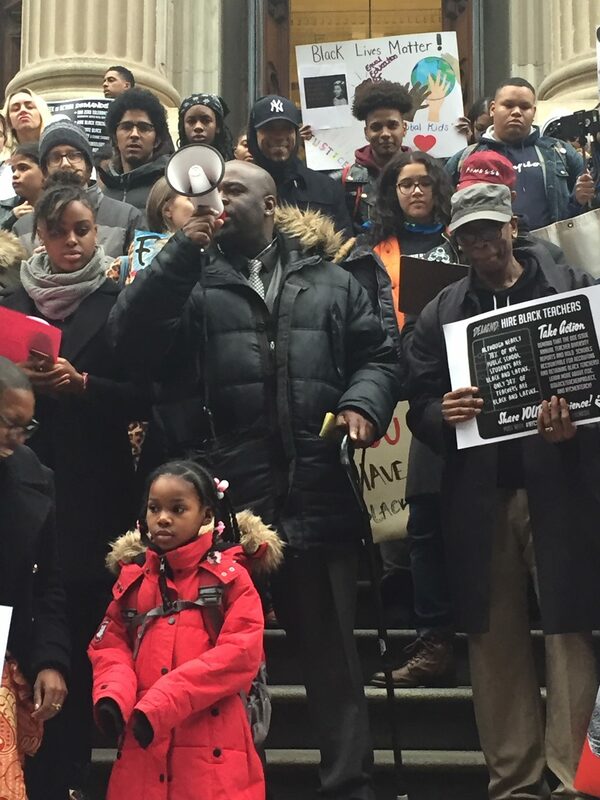 I wasn’t the organizer for the rally, but I am proud of being a part of it and helping to irganize the week of action in Brooklyn and bringing Brooklyn students and educators with me to the rally in this unified movement. There is a massive effort by the DOE to ensure education is equitable for black and latino students. If you look on the funding side, Schools predominantly serving the B&L community receive $5k more per child than their counterparts. There are countless programs in DOE that targets the most disadvantageous students, which often or not is in the B&L community. I would contend that they have gone above and beyond in an attempt to make sure these kids are receiving a quality education. The curriculum teaches major historical events that had impact on world views, key aspects of all cultures are taught but specifics must be researched by themselves or taught at home. In addition, hiring teachers strictly based on skin color is misguided. What we should seek are quality teachers regardless of race. The fact that a fairly liberal city with chancellors that emphasized equity has trouble getting minority teachers into its classrooms speaks loudly about the chosen professions of the community. Girl… Katherine… you… you are mistaken. Take it from a student who is currently in the system and witnesses the inequities that students of color must face every day. Black studies need to be incorporated into the DOE curriculum. That doesn’t simply mean learning about slavery… It’s not all about funding. It’s about how we treat each other as human beings. That comes before money, that comes before Anything else. IM HONORED TO PARTICIPATE IN THIS MOVEMENT WITH MY BROTHERS, SISTERS, AND ALLIES!! !